Nixon's visit (only five months before his resignation) was seen by national journalists and politicos to be a trip to one of the few places where he would still receive a warm reception, and it was quite warm indeed. Nixon took the stage, played two songs on the piano, and bantered with Roy Acuff. 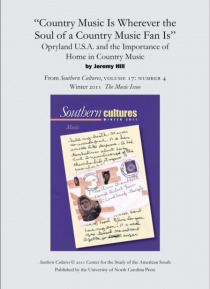 "e;When the Opry changed sites it wasn't without a good deal of growing pains, angst, and rhetori… cbut by taking old values to the new venue, not to mention a circle of the original old floor, country music survived the switch.This article appears in the 2011 Music issue of Southern Cultures.Southern Cultures is published quarterly (spring, summer, fall, winter) by the University of North Carolina Press. The journal is sponsored by the University of North Carolina at Chapel Hill's Center for the Study of the American South.